Frustration of the magnitude I was experiencing on Monday sends me into full-blown procrastination mode. My plan for Monday, which quickly fell apart, was to immerse myself in all things Tom Terrific while finishing up a post I’m writing on TB#12 (for those of you who aren’t football fans and pay attention to real news only TB#12 refers to New England Patriots’ quarterback Tom Brady #12). I had intended to publish the post, “If Loving Tom Brady Is Wrong, I Don’t Want to Be Right” on Tuesday. 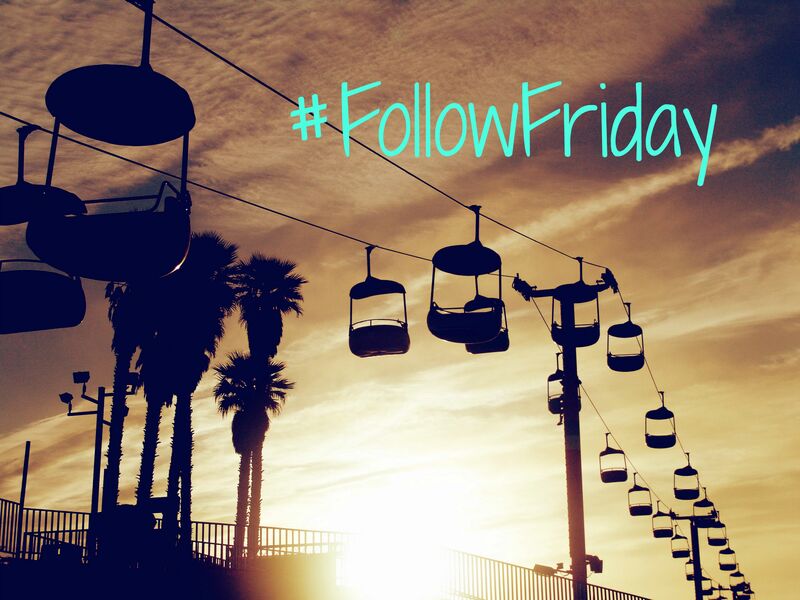 Instead of working on the post, I played games on my phone and laptop, spent a considerable amount of time on Pinterest and Facebook while ignoring Twitter where I could’ve at least participated in #MondayBlogs. I knew I was going to miss my self-enacted deadline by futzing around on my electronic devices. I knew this was self-defeating behavior but I couldn’t stop myself. My deadline seemed insignificant compared to my foul mood. 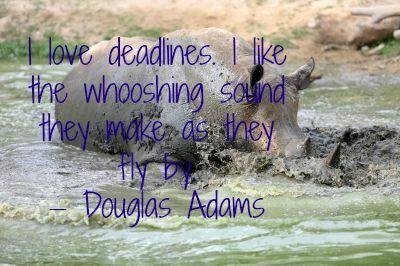 While online, I did google writer’s quotes and found my Writer’s Quote Wednesday quote for the week by English humorist and science fiction novelist Douglas Noel Adams (DNA as he is referred to by his friends and fans). DNA made me laugh for the first time that day, which considering he was a humorist is a good thing. Given that I had just thrown my #TB12 deadline to the wind, his quote resonated with me. 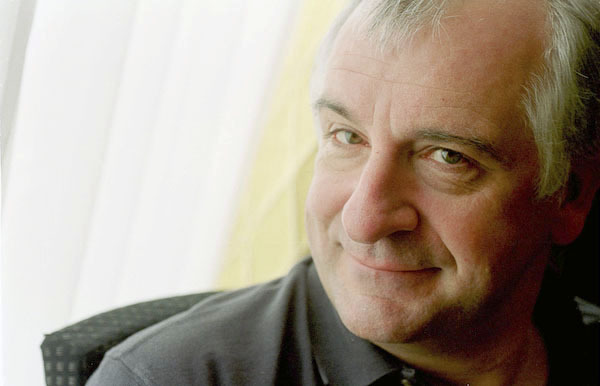 English humorist and science fiction novelist, Douglas Noel Adams was born in Cambridge, England on March 11, 1952. In 1974, he earned a Bachelor of Arts in English literature from St John’s College in Cambridge where he also earned a Master of Arts. Adams passed away suddenly from a heart attack in Santa Barbara, California (his residence at the time) on May 11, 2001. He left behind his wife Jane Belson Adams, whom he married in 1991, and their six-year-old daughter, Polly Jane Rocket Adams. An environmentalist, DNA campaigned on behalf of endangered species such as the black rhino. Save The Rhino Foundation runs an annual Douglas Adams Memorial Lecture near DNA’s birthday to raise money for environmental campaigns in his memory. The last published work of Douglas Adams is The Salmon of Doubt: Hitchhiking the Galaxy One Last Time, which was published posthumously in 2002. The Salmon of Doubt is a collection of DNA’s writings including letters, short stories, speeches, articles, and chapters of DNA’s unfinished work-in-progress that he intended to title The Salmon of Doubt. For additional information on DNA’s life and work including his work on radio and television, visit his Wikipedia page and website. Love that sound of deadlines whooshing by – so thrilling to kick at the traces and go my own way. Hopefully, the week improved. 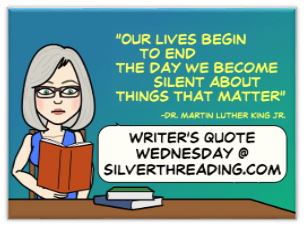 And what the heck, you got a great quote Wednesday out of it all.